Combining his background in marketing and graphic design with a fast-growing passion for wine, Daniel Hill is on favourable ground at Seabrook Wines in the Barossa Valley. The Tasting Room & Wine Club Specialist, who says he fell into a career in the wine industry, is using his skills to help grow the brand. Daniel’s approach includes exceptional end-to-end customer service that begins when customers enter the cellar door, and extends beyond their visit. The family-owned Barossa Valley winery is run by Hamish and Jo Seabrook. Hamish is a first generation winemaker, but comes from a family of wine merchants and educators with deep roots in the industry. It’s a rich and unique story – and one Daniel says is worth telling. We asked Daniel to share more about his background, Seabrook’s approach to telling their story, and how the brand is elevating their customers’ experience. What’s your role at Seabrook and how long have you been with them? Technically my role is ‘Tasting Room & Wine Club Specialist’, but my position within the company is multi-faceted so in addition to the day-to-day workings of the tasting room, I manage the website, social, digital and print media, investigate new marketing and sales opportunities, and look after local trade accounts for the Barossa region. Seabrook Wines’ story is an interesting one. How do you articulate the family’s story about the shift from wine merchants to makers? There’s definitely a wonderful history behind the brand and why we do what we do. Seabrook is a first generation producer and Hamish is the first winemaker in his family, and the first to be making wines under his own label. However, the wine merchant business dates back to 1878. Hamish’s dad was the last to run that business, but due to the evolving market he decided to conclude that business in the late 1970s and move to the Barossa. In your storytelling how much do you focus on this history? We’re up-front about the fact that we’re a young producer and a new kid on the block despite that history. The brand is still quite unknown to today’s younger market, with a lot of the older generation familiar with the W.J. Seabrook & Sons releases. How is the wine industry changing? From my point of view, there’s been a cultural shift in the way people consume alcohol. The focus has shifted to quality over quantity, with more people enjoying better wine, spirits and beers. How do you set yourself apart in a very busy market? Our Tasting Room offers gorgeous views from our deck, where guests can take in the surrounds of our estate vineyard. Guests that visit Seabrook are welcomed, and provided with a relaxed, fun, and informative wine discovery experience. We want people to slow down, take in the surrounds, enjoy our products, hear our stories, and be entertained with our company; all in a comfortable and welcoming environment. Making guests feel at home is key to what we do. The three most important factors to the Seabrook customer experience are the product, the experience, and the service. If any of these falls short of exceptional, we would have failed to create a memorable and life-lasting experience. How do you elevate customers’ experience at cellar door? The customer experience begins the moment they walk through our doors. Visitors are welcomed with a warm greeting, a handshake, an introduction to our tasting room, and most importantly a glass of Riesling! From there, we seat the customer like you would in a restaurant; seat them, pour water, ask them questions about themselves and their journey, and explain to them how the experience will run. Each visitor is treated like family, with the hope that they feel welcomed into our extended family, and begin a lifelong relationship with Seabrook as people and a brand. This doesn’t change after they’ve left our Tasting Room either. Personalised emails, phone calls, and invites to offsite events allow us to strengthen the wonderful relationships that we forge in our Barossa Valley home. We also continue that personalised service once they’ve left. I usually grab their order form and jot down their names so I make sure that I don’t forget. We place a card with a photo of our winery and a handwritten thank you note into their box; it doesn’t matter if they’ve bought one bottle or 10 bottles. We want our customers to feel appreciated, and that reciprocity and personalisation is key. Why is it important to go the extra mile for your customers? I remember when I began visiting cellar doors on a journey to learn more about wine. The overall experience was quite daunting and left me questioning whether wine was for me. When I sat with Hamish to discuss how we could create a unique and tailored tasting experience here at Seabrook, I needed to ensure it was welcoming, relaxing, and fun overall. I don’t want anyone to walk out of our doors and feel the way I did many years ago. Wine IS for everyone. It shouldn’t feel pretentious or exclusive, and people shouldn’t feel daunted by it. 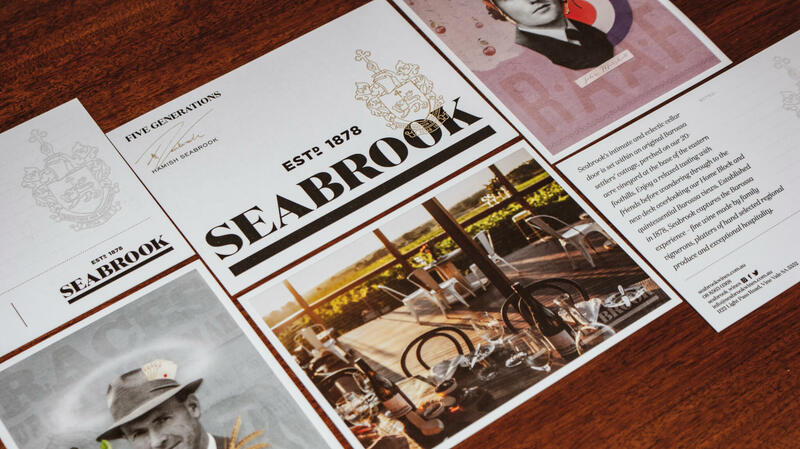 Visitors to Seabrook should leave with a lasting and positive impression of their time with us – and then be transported back to that moment every time they open a Seabrook wine. The idea for thank you cards was conceived by owner Jo Seabrook at one of Kiikstart’s customer experience workshops. To find out about future sessions, or to work with Kiikstart, visit email enquiries@kiikstart.com.